All the heroes have (finally) turned in for the night, so it's time to kick back with a mug of ale, a fist of dice, and pouches lined with adventurers' gold! The Wench joins the party at The Red Dragon Inn and she's bringing the rest of the tavern crew — Jasper the Bouncer, Molly the Stablehand, and Warthorn Redbeard — with her! The Red Dragon Inn 7 is a new, 2-4 player standalone expansion to The Red Dragon Inn series of games. In this game, you and up to three of your friends will play as the staff of our beloved tavern, enjoying the night after all the adventuring patrons have passed out in their rooms (or stables). Of course this won't be a quiet night of relaxation! Gamble, brawl and drink the night away as you prove you have what it takes to keep up with the heroes you handle night after night. 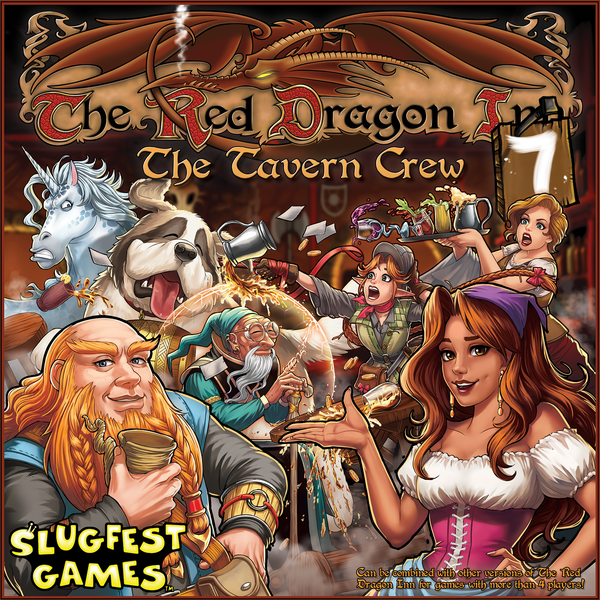 The Red Dragon Inn 7 can be combined with all of our previous releases, letting you mix up the characters (and the mayhem) for games with four or more players!